Railpictures.ca - Bill Thomson Photo: Royalty at West Toronto! 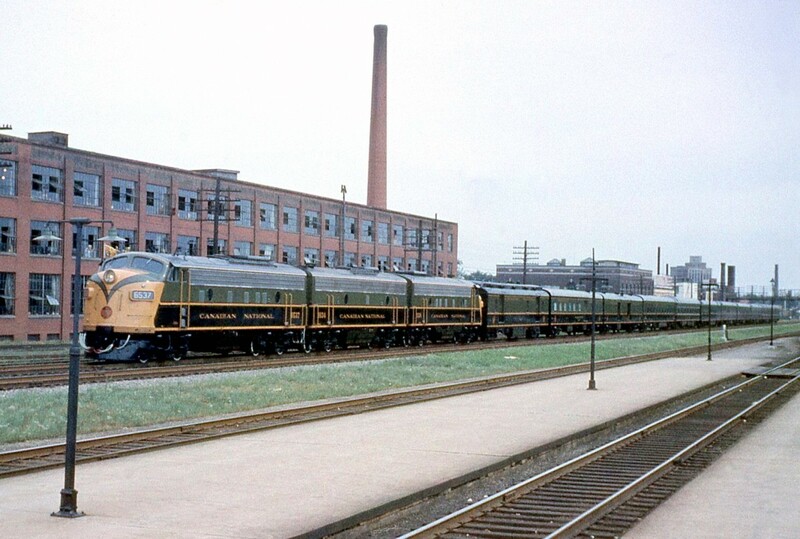 A special Canadian National Royal Train carrying Princess Margaret heads northbound on CN’s Brampton Sub (later known as the Weston Sub) through West Toronto, enroute to Stratford Ontario. Leading the charge is a set of gleaming, spotless A-B-A General Motors Diesel F-units with FP9 leader 6537, less than a year old at the time (built at GMD’s London ON plant that year in 1958). Note the white MU hoses and painted wheel edges – a classy steam-era touch. The last two of the 11 green, yellow and black coaches are special Canadian Government coaches (normally used for the Governor General). The train is heading north towards the West Toronto “diamond” interlocking near Dupont Street, passing by the platforms of CPR’s West Toronto Station (demolished by CP in 1982 despite efforts to preserve it). A group of typical industries that defined “The Junction” for decades are present in the background, most still remaining: (left to right) the red building behind the power is Viceroy Rubber (now a storage building), the Toronto Hydro-Election Junction Substation is to its right (built 1911, still in use), behind that are the white and grey buildings of Glidden Paints (demolished a number of years ago and being redeveloped). The Wallace Avenue pedestrian bridge that dates from 1907 can also be seen spanning the tracks in the background (listed as a heritage property by the city). More classic West Toronto railway action: CNR Northerns doubleheading on a freight: http://www.railpictures.ca/?attachment_id=19407 Winter steam by the diamonds and interlocking tower: http://www.railpictures.ca/?attachment_id=16093 CPR steam doubleheading northbound at the station: http://www.railpictures.ca/?attachment_id=14058 CP CLC-built “Train Master” in transfer service: http://www.railpictures.ca/?attachment_id=15874 NYC/PC run-through freight power on CP: http://www.railpictures.ca/?attachment_id=15002 | Railpictures.ca – Canadian Railway Photography – photographie ferroviaire Canadienne. Caption: Royalty at West Toronto! A special Canadian National Royal Train carrying Princess Margaret heads northbound on CN's Brampton Sub (later known as the Weston Sub) through West Toronto, enroute to Stratford Ontario. Leading the charge is a set of gleaming, spotless A-B-A General Motors Diesel F-units with FP9 leader 6537, less than a year old at the time (built at GMD's London ON plant that year in 1958). Note the white MU hoses and painted wheel edges - a classy steam-era touch. The last two of the 11 green, yellow and black coaches are special Canadian Government coaches (normally used for the Governor General). The train is heading north towards the West Toronto "diamond" interlocking near Dupont Street, passing by the platforms of CPR's West Toronto Station (demolished by CP in 1982 despite efforts to preserve it). A group of typical industries that defined "The Junction" for decades are present in the background, most still remaining: (left to right) the red building behind the power is Viceroy Rubber (now a storage building), the Toronto Hydro-Election Junction Substation is to its right (built 1911, still in use), behind that are the white and grey buildings of Glidden Paints (demolished a number of years ago and being redeveloped). The Wallace Avenue pedestrian bridge that dates from 1907 can also be seen spanning the tracks in the background (listed as a heritage property by the city). A great capture Sir! What a handsome paint scheme! It’s not behind steam, but the color scheme is the finest presented by CNR. Thanks for the confirmation Stephen. Just wanted to be sure it was not my imagination. That is definitely the royal standard. Wow what a great shot! I have never seen F units so clean. Maybe its just my imagination but it looks like the right side of the F unit is flying a royal standard where the flags normally are placed?